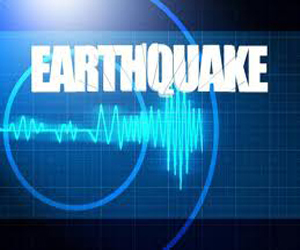 There’s a whole lot of shaking going on throughout the U.S. lately with all of the earthquakes. (Oklahoma having the largest one at 5.9 just this past Saturday and a swarm of over 700 earthquakes in the Sierra County, CA since August). And I have to say, it feels like there’s LOTS going on with Preparedness Pro nowadays too. So I’ll get you all up to date, address a couple of tidbits that are relevant to your self-reliance efforts, and share with you a couple of new features with Preparedness Pro. For starters I thought it might be appropriate to sum up all of the changes at Preparedness Pro due to one specific factor—focus! My goal for 2011 was to help 100,000 people become better prepared. While I certainly am unable to name every person, I am able to see a portion of the results from such a goal all throughout this year and with 2 months still to go, I know that I will have certainly contacted with that many individuals regarding my message. I can’t make the decisions for others, but I can sure try to make a difference. So, that being said, I’ve set a new goal for 2012 and I believe it’s fitting especially with all of the hoopla about December 21, 2012. I’ve set an even bigger goal for 2012 in terms of classes, radio shows, articles, and so much more. As such, we’ve had to make lots of changes now so that we can handle the added infrastructure that’s coming. First we’ve got a new website under construction. Please excuse our dust—or at least the changes that you’ll be seeing over the next couple of weeks. We had to turn on the “new” site at some point in the process in order to get everything in place. So please bear with us. The new site is going to feature video tutorials, more frequent articles and guest articles, sponsors, and significantly more classes professionally produced on DVD along with great resource guides. We’ll also have a “members only” section in which our readers will be able to get their hands on exclusive video and audio tutorials, guest interviews and more! Along those lines I discovered that in order to meet my goals for 2012 I had to part ways with the network which hosted my radio program for the past year. It was a great beginning, but we “grew out of it” some time ago and require more flexibility with time so that we can bring you high profile experts, undiluted content, and most of all a more professional audio and archival access of the productions. When I provide a show on a specific topic, I want to do so without any reservations or boundaries in the interest of sharing quality information, with professional quality audio, and with simple access to everyone regardless of the time of the show. My standards led my show to the #1 spot repeatedly and even as a contender with over 11,000 other stations. It was a great experience to get my feet wet and to have a baseline to better help me formulate what I wanted my ideal show to be. But after doing it for a year I realized that I don’t fit easily into someone else’s idea of a peg hole. So, perhaps I’m taking the self-reliance mindset to beyond crazy, but I’ll be launching my own show beginning the first week of December. I’ve already got some great content that I’m just busting at the seams to share with you all! And better yet, it will all be available right here on Preparedness Pro.com so you can either tune in at your convenience from your computer, download the shows to your ipod, or even get a transcribed version of the show so that you can read it at your convenience. I’ll give you more details as we get closer to the launch date. Next, we’ll be creating a LOT of video tutorials for you—each of the short and simple in hopes that we can make your self-reliance efforts more realistic and practical. Continuing on…the one thing that really sets Preparedness Pro apart from all of the other sites, authors, bloggers etc. in the “preparedness community” is the 10 Principles of Preparedness. The 10 Principles help people to properly prioritize their journey towards a more self-reliant life and in doing so helps to keep things in their proper perspective so that such efforts really can be done peacefully as opposed to panicked, and also results in generating a greater sense of calm in one’s life. So, we’ve had some fun with artists over the last couple of weeks, created an icon for each principle of preparedness and we’ll be categorizing each article via the icon which that article to which it’s most relevant. We’ve also created two sub-principles of self-defense/security and sanitation since there’s so much content about these topics and these two intermingle among multiple principles of preparedness. This way, you can simply read the articles as they are posted or you can focus on a specific principle of preparedness. And most of all, it reinforces with each and every article the Ten Principles of Preparedness so that even a new reader on our blog can recognize that these principles play a key role in what I write about, teach, and what they can rely on sensibly for help in their preparedness efforts. Most importantly, I don't have to do all of this alone. I've got some great teammates who are committed to getting all of this in play for us. Now, on to some quick news: I posted an “alert” on the site last Saturday. I must admit, I feel terrible that I wasn’t able to post it sooner than that—so be it. Anyway, the peanut crops have produced 50% of their anticipated crops. As such, the cost of peanut products i.e. peanut butter, peanut, oil, etc. were specifically scheduled among most name brand stores and warehouses to dramatically increase today, Monday, November 7th. Some of the stores throughout the nation actually increased as much as 2 weeks ago, and some will actually be kind enough to wait until they sell through the less expensive stock they still have on hand. But the fact of the matter is, you will indeed see a skyrocket of AT LEAST 40% in the price of peanut butter and you shouldn’t expect the price to come back down to last month’s levels—ever. Yes, ever. The reason being is that you have a natural cost of production increase anyway. So that will be a mild increase. But you also have a standard business practice which shows that once high prices are introduced to consumers and they still purchase it, then there’s absolutely no motivation to bring prices back down when raw products become readily available again. So, if you haven’t stocked up on your peanut butter, you may get lucky over the next couple of days and still find some at the pre-40%-50% price increase. If so, stock up. Unfortunately, you may also find it hard to find, period. The Sam’s Club near me was totally out of all brands and Costco only had 9 of the natural brand jars left. As you know, peanut butter is a great staple food that’s shelf-stable making it great for your long-term food needs. While I was doing additional research on the peanut butter scenario, I came across some articles that gave me pause to consider the plight of pecans which recently experienced a 30% increase in price (the fall of last year). However, the news is just starting to come out regarding two interconnected facts about pecans. #1: Just like the peanut crop, it looks like the pecan crops (which don’t usually finish their harvest until February) are also near the half-way point of their traditional harvest amount—depending on the region—due to drought. Ouch! So there’s bound to be a price increase there, right? But here’s where it gets really awful. China has been purchasing about a quarter of all U.S. crops in the past, but this year, they have tripled that request and are paying between $10-$15 a pound. So do the math. You’re the farmer who only has ½ of his standard crop to make money this year. Do you sell it at $6 a pound or over double that to China? Sorry, the answer is not exactly as Pollyanna as some would like to believe. 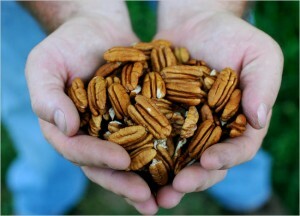 In fact, some farmers have sold their entire crop of pecans to China this year. And in fact, the Chinese want to purchase the most premium of pecans—big and the best. In 2009 China bought more pecans than all of the rest of the world's exports combined, and their appetite for them has continued to increase. Not exactly a winning combination for Americans wanting to purchase pecans this Thanksgiving season, especially because farmers will have to export the pecans next week in order to meet the intended deadline set by China. 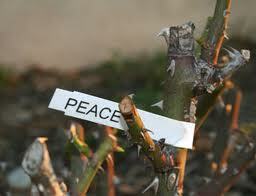 Unfortunately, the recovery from the damaged trees won’t be easy. A pecan tree takes 8 to 10 years to produce fruit. For the record though, pecans store very well in a cold storage. I have some that I put in Mason jars and “food savered” nearly 10 years ago. I got into them this weekend and they still tasted absolutely delicious! So, perhaps you might want to have nuts on the brain this week in order to make sure you’ve got what you want next year. Just a suggestion. Lastly, I’m seeing a great deal of speculation of a bumper crop for wheat this year. I’ll believe it when I actually see it, but if you see wheat getting well below the prices of this past year, I’d jump on it if I were you and stock up before it skyrockets again. And yes, it will skyrocket and with a vengeance. More on that later. Guess I'm going to go store hopping today for peanut butter! I love pecans, but they're not in our budget, especially ifI'm going to take up any wiggle room with peanut butter. I'll be very excited if wheat prices drop so we can stock up as our food storage has none. My parents got us a wheat grinder for Christmas (I'm supposed to pretend I don't know) so my husband can't have any complaints about having to store wheat. I'm very excited to have found you through Pinterest. I can use all the tips I can get. Our food storage is just small, and mainly rice so far. I'm trying to add what I can when we can afford it, and even a little when we can't really. Great post and great blog! I need to stop by here more often as I sure enjoy and learn a ton from your posts. Thanks for all you do. Holy Moly! I'm so excited about all this great growth and the changes you're making - especially the accessability of video and the new radio show! Or maybe it's the whole icon - that, I think, is a stoke of genius! Anyway, yeah! And the shelves here at our WalMart are looking pretty peanut butter bare - thankfully, I started stocking up months ago when you first said there was going to be a problem! Thank you! Got lucky in my area on the peanut butter. There's a discount grocery that happened to have a lot of peanut better that was originally purchased for a day care that went belly up. The price was $1.69 for a 16 oz. jar. I offered the owner $1.50 a jar and planned to buy 20 jars..he countered my offer for a $1.25 jar! Granted, it wasn't free, but still better than paying $2.79 at Wally World. Works for me! I have about 8 jars of peanut butter, and I just feel like that's not enough. Want to run and buy more so I can have enough for peanut butter cookies. But alas, money has to go elsewhere. Thanks for the heads up on the pecans though. I'll ration what I have for my sweet potato pie. Interestingly enough, the day after you made this post, there was an article in our local paper stating that the price of pecans was on the rise due to the poor crop this year. Yields are 50% less than normal. Funny that I already had that information from you! We are lucky that we have a fella who sells us shelled pecans for only $6 a pound and there are pecan groves in our area as well. The neighbors are happy to let us pick up the pecans at no charge. I have 10 pounds of pecans in food saver bags nestled in my freezer and I plan to get more as finances allow. How blessed we are! Thanks for the valuable information, Kellene! Sometimes I wonder how I ever managed without you! Congrats on the growth and your new ventures...it's great that you are seeing the demand for preparedness now. Sam’s Club only increased theirs 25% as late as last Friday, just FYI. I stocked up on peanut butter a couple of weeks ago. Heard it on the national news as well,which was surprising! Am so grateful for all the 'heads up" you give us so we can stretch our dollars. Very excited about the new radio show. The old system drove me crazy. 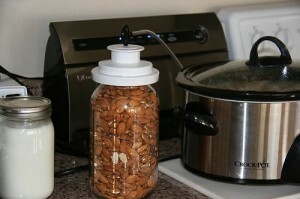 I have a food saver and have tried sealing jars with nuts, choco. chips, etc., but they either won't seal or stay sealed. Don't know what I am doing wrong? I'm actually allergic to peanuts (I tell people that I'm so allergic to peanuts that Snoopy makes me break out in a rash! ), so I've been stocking up on almonds. I buy the 3-pound bags from Sam's Club and then vacuum-seal the nuts in mylar bags. I should be able to make my own almond butter pretty cheap! You'll also be able to make almond milk really cheaply as well--even less than powdered milk in many instances. My girlfriend in Chicago said the medium size jar of peanut butter is $4.67 up there now. My cousin in Piney Flats, Tennesse said the stores by her house are rationing peanut butter now - one jar per person. I hearing those kinds of stories all over the U.S. Here in Colorado, pecans are 11.98/lb - ON SALE - at the City Market/Kroger. The "off sale" price, which I'm sure will be the regular price after Thanksgiving, was 16 and some change! Good thing we have a bunch and don't use tons of those anyway!